I had a great sleep probably the combination of good food, great beer, the wonderful outdoors long with some superb company. 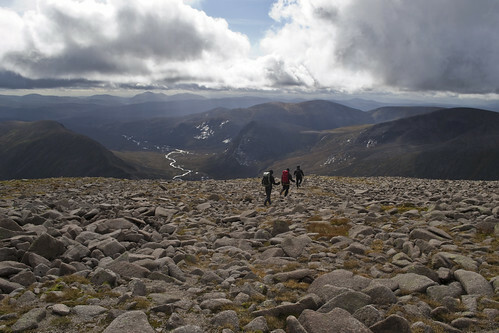 If you want you can read about that here, The Fantastic Four head to Aviemore? I spent a nice toasting warm night snuggled up in my sleeping bag and bivi under the TrailStar. Everyone was stirring and getting up and pretty sure Steve and Colin had been up for a while compared to Phil and I. We started to get our self sorted. Personal admin and all that it entails. Squaring away the shelters we packed the cars and got ready to leave. Picking up our deposits from the office while signing out. We got into the cars and formed an orderly convoy with me at the back. 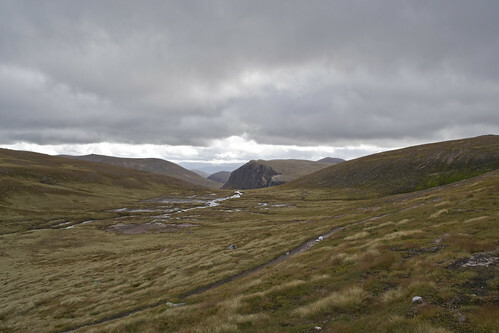 I wasn't sure how to get to the Cairngorms Mountain Railway. 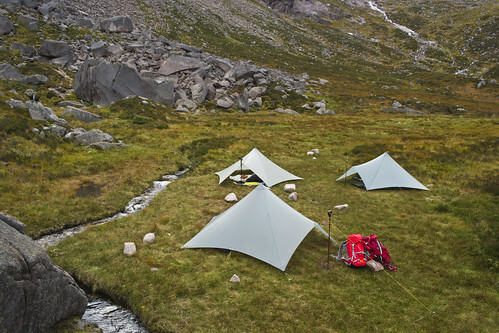 We left the site heading east and south along the road towards the Glenmore Lodge where Phil had been a few weeks earlier doing his Mountain Leaders course and Loch Morlich. After the first couple of corners. I noticed that something was hanging from underneath Colin's car. Steve and Phil were in the lead car followed by Colin then me. Every time Colin hit a bump I expected, whatever it was, to come loose. Luckily it hadn't. Once rounding the loch the road started to gain some height heading towards the ski lifts and the railway. After a couple of switch back corners we reached our destination, the car park. We parked in the lower car park. Getting out I mentioned to Colin that I noticed the arse hanging off the back of his car. Colin said that it had happened recently but had obviously gotten worse if I was seeing. The exhausts heat shield was loose. A broken clip most likely the culprit. Having already packed our gear at the campsite it was just a case of grabbing our kit locking the cars up, which we did. This was going to be a busy walk. Plenty of people about looking like serious walkers. However I was a bit disappointed I never noticed any blue with the red piping Ron Hills kicking about. Shame. A few buses with tourist types not equipped for the hills, hopefully they were heading up the railway to the top of Cairn Gorm. It was a nice well constructed path out from the Ski Centre basically following the Allt Coire an t-Sneachda. We dropped down from the car park and then turned and started gaining height. I did learn on that path though that walking with two poles and a camera slung out front is no good. Kept clanging my hands off the camera. It was really annoying so much so that it was distracting. I collapsed one and attached it to my pack. That was that, problem solved and I could get on with walking. To start with, you are already quiet high up. Well think about it. The car park sits about 650 metres above sea level. The path takes a turn and you start to see the top of Stob Coire an t-Sneachda. I really should get better at my Gaelic. I'm never sure if I'm writing the thing correctly or not. As we followed the path further up I started to see the Central Gully and Aladdins Couloir become bigger and bigger like a great gray slab of impassable stone. A giants ruined dry staine dyke. 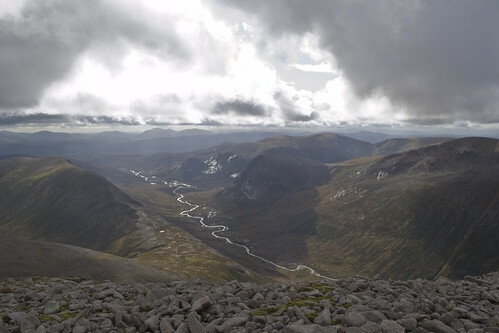 It is the view and all of the view, save if you turn 180 degrees and look back towards Aviemore. It probably doesn't help that your view is channeled by Fiacaill a' Choire Chais on one side and Fiacaill Coire an t-Sneachda on the other. 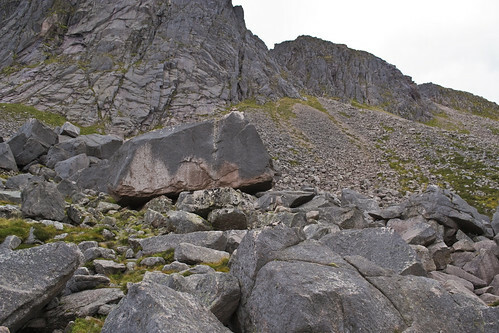 By now the well constructed path had given way to a boulder field. Not that you could see where you were going. You just have to look for the well worn stones. Walking became more of a hop, skip and a jump. Well it did for me and my short arse legs. It reminded me much of the Lord of The Rings. The men of Rohan defending the burg. Helm's Deep without the Orcs. Thankfully. We stopped for a break at the bottom of Stob Coire an t-Sneachda while we watched a couple of climbers going at it up on the big slabs of the Central Gully. All roped up with safeties clanging and the occasional shout. 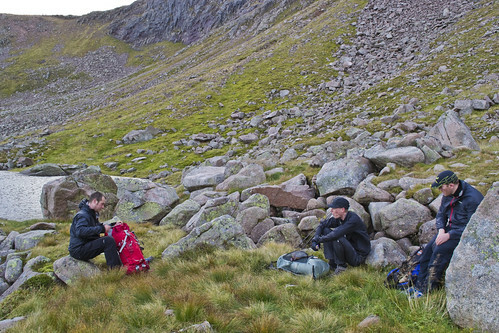 We all dropped our packs and took on some water and food. Jelly beans & granola bars for me. Fueling the body for what looked to me an almost vertical climb. Steep indeed. 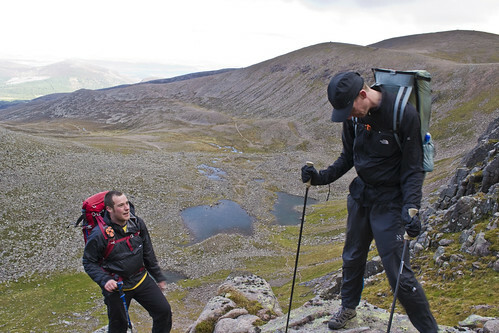 We started the climb up Coire an t-Sneachda switching back and forth on the well worn path. I was at the back slowing down my long legged companions. It was steep going for me. Lots of knee to chest action getting my short leg pistons firing. It was a good easy pace, we stopped often to let me catch up. Then Phil suggested that I go to the front and set the pace. Never a wise idea in my opinion. Reluctantly I made my way to the front and took up the lead. Not that I don't like to lead I just hate to think I'm holding up people. However we came unstuck almost immediately when I thought I was following the path when in fact it was more likely a deer track. Oops. The trouble with putting me at the front missing a turn. We doubled back and I took more care and did a fair bit of checking that I was going in the correct direction. Which was generally up. We stopped about 3/4 of the way up. More than likely for me to catch my breath. The other 3 being fit as butcher's dug. I was happy for the break and to enjoy the view. While we rested Phil explained some of the training he had been doing in this very area for his ML course. All about rope work and getting people safely off the hill. Even pointing out the rock they had used for an anchor and belay point. Now with my breath back in my lungs we headed up the last part and onto the Cairngorm Plateau. Once on the plateau you could really feel the wind. It was blowy but not too bad. When I say not too bad I mean it wasn't as bad as forecast. However the Tookite nearly to flight crossing over the lip. Nearly back to the car park in double quick time. Also with the wind was specks and spots of rain carried along in air but nothing to worry about. It was just spitting. There was almost a constant stream of people, walking this way and that. As groups or pairs and a few individuals. Left you take to Cairn Gorm itself but that wasn't where we were going. 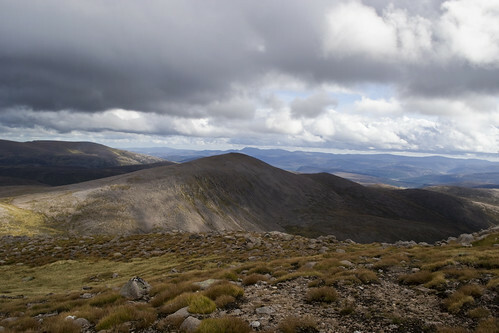 We were heading into the wind and a generally southerly direction and Ben Macdui, Beinn Macduibh. The second tallest mountain in the UK only Ben Nevis being taller or higher, which ever you prefer. It stands 1309 metres or 4295 feet in old money. It's a big chunk of mountain. I was amazed at the amount of routes to the top. People appeared to becoming from all directions. I was pretty sure no-one had really passed us on the way up and on to the plateau. I'm even more than sure we passed a couple. Anyway plenty of people were heading in the same direction for the same spot. The light was magical because of wind and the cloud, sweeping across the sky. I was for a while particularly captured by the light hitting the top of Carn Toul. To the extent I stumbled a couple of times. No matter how hard I tried I couldn't quite get it in my camera. 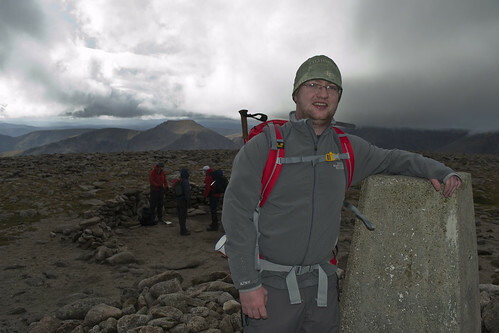 Ben MacDui summit was the busiest top I've been on for a long time. Not quite heaving but pretty close. Reminded me a lot like the Buachaille. Lots of groups milling around in pockets around the top. Most looking for shelter from the wind. Climbing up the cairn I touched the trig point. That's the highest I've stood in Scotland. Yep never done Ben Nevis, yet. Phil graciously took my camera, I struck my best Tam Weir pose and he fired the shutter a couple of times to make sure that the moment was captured for all eternity or until the hosting services die or I hit delete, accidentally. Trig point touched and handshakes all round. Another hill complete and if you're into that sort of thing, another bagged or a tick in the list. We left the summit to the crowds. I left it having was one of those on top of the world feelings that you often get standing on a summit. 360 degree views. A feeling of warm achievement. I was happy to busy pondering that I hadn't notice the view as we walked off the summit. I was too busy looking around instead of looking. I started to drink it all in as we head down hill slightly. Then we stopped and that's when it really hit me and it wasn't just the wind getting stronger. The view, the view. It is true, a thing of beauty is a joy forever. Keats had it right. It was like a knock out punch; an upper cut from Tyson, my brain exploded. There was so much to take in. The weather wasn't perfect but it didn't matter. It was expansive, mountains rippling off on all directions. Disappearing off into the horizon, progressively getting bluer until they merged with the sky or disappeared under duvet of cloud. The Dee a shining silver ribbon snaking it's way along the glen or like and adder sunning itself, trying to gather in all the rays of heat. 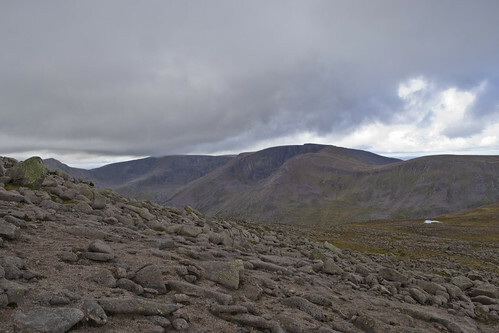 The most famous lairig ghru. The mountain pass but sometimes these mountains don't let you pass. We headed east to pick up the path towards Loch Etchachan and Creagan a' Choire Etchachan along the way we stopped off in a small ruin. Not like a sheiling or anything like that more of an old rescue hut and I'm sure Colin said that it was something like that. 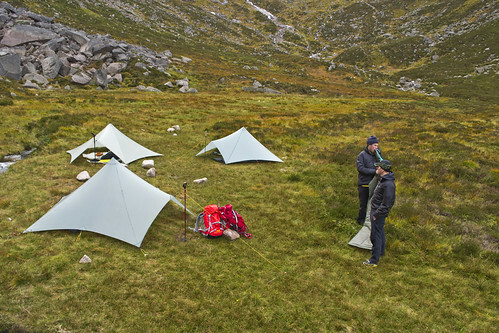 It was good to get shelter as the wind on this side of Beinn Macduibh was very strong. Hunkering down behind the ruined walls we all pulled on our insulating layers and got our lunches out. We sat about talking and eating, every now and then popping our heads above the stones to see what was happening. That's when we noticed someone coming up from the direction of Hutchison Hut. It looked like he was carrying a small person strapped to his back but as he got closer it became apparent that it was just the biggest rucksack known to man. I kid you not when I say it was the size of me. It was rammed solid. I would fancy carrying that. Hat's off but where is the fun in that and to top it of he was wearing jeans. Yes, denim in the hills. He and his partner were heading in our direction. We pack our rubbish away and left the tourists to shelter of the ruin and made our way down to path to Loch Etchachan and the little loch. By this time my lack of any reasonable fitness was starting to show. Even on this downhill section. I was walking even slower. I was starting to feel it. My wee legs were getting tired. The pistons had been pumping hard all day. No matter I was still enjoying myself. The views were expansive, every time I stopped there was always something to take in or a breath taking view. 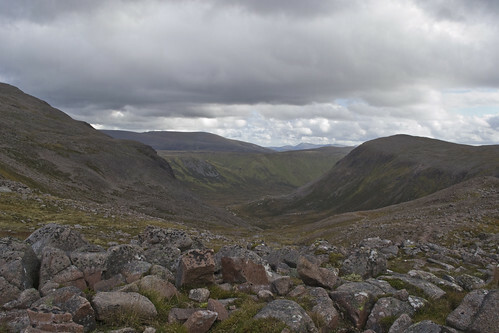 Derry Cairngorm, looking down the Narrow Gully. It was just great. It all put a smile on my face. A rainbow over Loch Etchachan was just stunning,the moody threatening clouds. There was always something to stop and gawp at. Plenty of jaw dropping scenery. 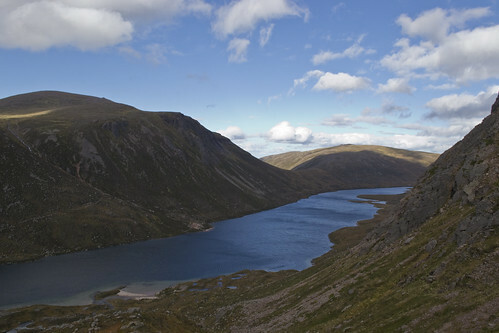 I walked only a short distance to be met by one of the bluest looking lochs I have seen. The cold September sky was reflecting off of Loch A'an or Loch Avon which ever you prefer. I stood for a bit just watching the space at the blue and green and brown the I found filling my eyes. 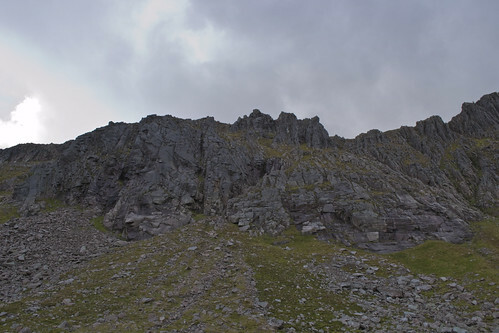 Next for my eyes to take in as I took the steep path down to the Shelter stone was the large cliffs and forms of Pinnacle Gully, Shelter Stone Crag and Castlegates Gully. All famous for their winter climbing. Finally I was catching up with the other 3 and I could see them heading towards the massive boulder. The Shelter Stone. It's impressive and that's probably a huge understatement. If I had been thinking at the time I should have put something in front for scale when I was taking photographs. It's probably the biggest boulder I have ever seen. Even now thinking back, I'm still amazed. Even scrambling up to it over huge rocks is great fun. When I got there. The 3 others were already inside. It's absolutely massive but there is no way you'd catch me sleeping in there. I sat by the entrance the others had ventured deeper into the black abyss. It certainly lives up to it's name. You are definitely shelter and if event's and weather ever unfolded to such at an extent, it would save your life. The stone has an unusual guest book, stowed away in a Tupperware box. Plenty of people writing their experiences, mostly and other stuff. Lot's of stories of smelly fingers and of kicking in back doors. We decided to pitch the TrailStars on the flat ground, Meur na Banaraich, the fingers of the dairymaid or so the translation goes. Maybe it harks back to a time when cattle grazed. I have no idea. It looked a perfect spot even if it was a bit damp. It was relatively even and level with plenty of room. We got the shelters up pretty quick, Phil's looking the worst. Probably because I was involved in the pitch but after some help from Colin, it was looking slick and taught. Then Phil and I went about pitching the OookStar inner which went up easier and quicker this time. It was looking very good. Sean his a highly skilled seamstress. A high quality piece of work and an ideal addition for Scotland in the height of the midge season. After a few photographs and some camp admin, Colin fired up his Backcountry Boiler. He was used bits of sticks and old withered heather but I still managed to create that great outdoors wood burning smell, eventually. It's an impressive bit of kit also. Doesn't take long or much fuel to get a full boil going. I think that's when all our stomachs started to rumble. The other stoves started to fire up and boil water for dinner and some tea or coffee. Not long after getting dinner sorted. We could here this whump whump whump whump whump. It was a helicopter for sure. No doubt about it. Whump whump whump whump whump. We stood in the middle of the shelters doing the circle dance, trying to pin-point the direction of the chopper. Not as easy as you think. The noise was just bouncing about this end of the glen bouncing off the stone. Then a twin engine Chinook HC take your pick of designation number, I’m not up with what current models that are flying. The cargo mark was Colin pointed out that it was a long way from home as the squadrons are based in England. I'm pretty positive he said Hampshire. Either the Brylcreem boys were out for a fun run or on an exercise.